This is the photo story of my recent photographic trip to the USA this last autumn. For the first time I was using both film and digital cameras to find out the ease or difficulties of using digital cameras for travel photography. There was quite a lot of research to do in order to maximise the time on the trip and not to miss out on an important feature near to the route. As it happened a great deal had already been done the previous year as the events of 9-11 in New York had caused a cancellation at the same time the previous year. I had a lot of help from Lenny in the States who sent me a great deal of useful and detailed information on many of the places I was going to visit. This is typical of my set-up every evening to view images and recharge all the various devices. 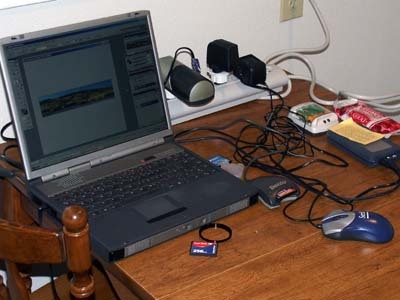 From Yellowstone onwards where my Digital Wallet was awaiting me after repair, at the end of each day the contents of the Compact Flash card was copied onto the laptop hard drive the Lacie external drive and the Digiatal Wallet. A real belt and braces approach. I used two battery chargers a Maha MH -C204f and a Hahnel Rapid Powerstation. The latter charges each individual battery which is preferred and I was able to last a full days photography with the Dimage 7 with only two sets of the four I had with me. The images from film were scanned in using a Nikon 4 scanner. The film was processed in Moab, Page and Colorado Springs so I was able to compare the results with the digital ones and I must say the images from the Dimage compared very favourably. With very few exceptions, all of the images you will see were taken with the Dimage 7 digital camera. The settings for most of the images were as follows. A few images were saved as Tif. 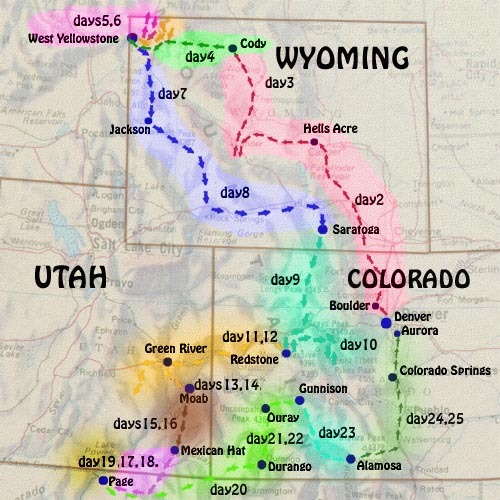 I flew in and out of Denver and covered three States - Utah ,Colorado and Wyoming and also touched Montana, Arizona and New Mexico. Nikon f4 SLR and three zoom lenses covering 18mm to 300mm . Asus Laptop computer and Lacie external hard drive. The Nikon 990 was used only for time lapse photography. I have divided the tour into 15 sections and you can either start at section 1 and work your way through or go direct to a particular section from the map or the text below.